Good morning. I thought that I would share my very limited halloween decor. 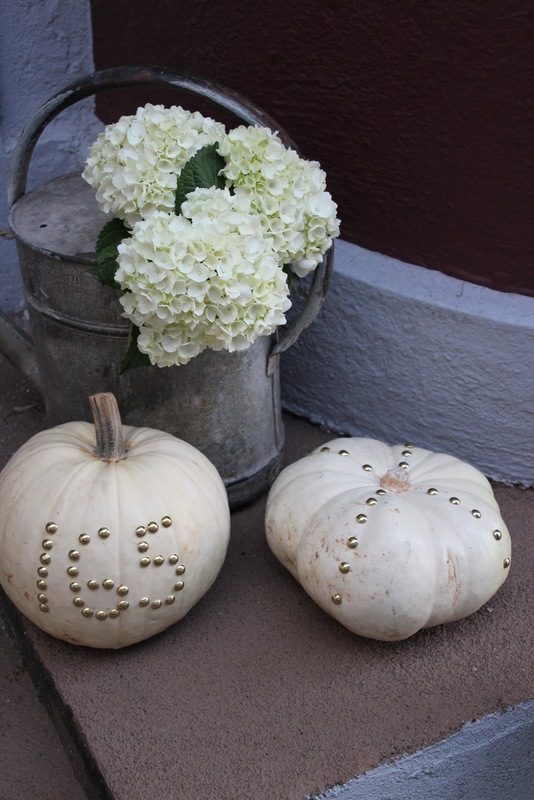 We live in an apartment, but I think that this house number pumpkin would be great on a porch or doorstep. This was the easiest project and is something that would be fun for the kids to do. When I found instructions they said to hammer nails in. But I just pushed upholstery tacks in. I thought that white pumpkins would be tough to find but that was not the case at all. Today I am going to make a white mini pumpkin wreath for our front door. I'll let you know how it turns out. I love the idea of house numbers, it is so popular to use numbers on everything we can add a number to. Love the white pumpkins my favorite. Thank you for your visit and beautiful comment. thank you for the kind words you two! my girls made ones with their monograms on them. they had fun. have a great day!